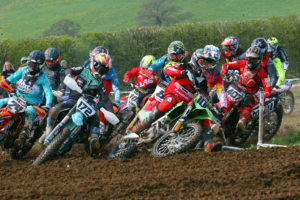 The Maxxis British Motocross Championships landed at Lyng in Norfolk today for the second round of the series. As expected the battle for MX1 supremacy was between the two MXGP top dogs of Shaun Simpson and Tommy Searle. Simpson fended off his rival in Moto 1 for the win, with Searle in striking distance for the win pretty much the whole of the Moto. Race two was looking to mirror the first salvo but machinery problems struck for Simpson who had to bring his machine home in fourth gear, so it was Searle who took the advantage, the second Moto win and the overall. Harri Kullas struggled from the traps all day but in both Moto’s he worked through the field for a 5-3 scorecard and third overall. Lewis Tombs continued his great season with fourth overall and Mel Pocock is growing in stature on the 450’s with fifth. Conrad Mewse once again looked a class act in MX2, but he doesn’t make it easy on himself and in both Moto’s he had to battle through the pack on his way to the front and double moto wins. Josh Gilbert looked solid at the front in race one and lead for 7 laps before the Mewse freight train worked his way to the front, with Gilbert finishing a comfortable second ahead of Alvin Ostlund, Bas Vaesson and Martin Barr. In Moto 2 it was Kiwi Dylan Walsh with the early lead from Liam Knight. Again Gilbert was running at the business end of the field moving into second on lap 5, while Mewse was clicking off places lap by lap, again gaining the lead on lap 7 where he stayed for the remainder of the Moto. Walsh rode well to beat off the challenges of Vaesson, Gilbert and Ostlund with the top 5 at certain points of the race only separated by less than 3 seconds. Gilbert with a second and fourth did enough for second on the podium behind Mewse with Vaessen taking the last podium spot ahead of Walsh, Ostlund and Barr. Joe Rizzi continues to pile in the race wins this season and with double moto wins took the MXY2 overall from Ike Carter and Kyle McNicol. A great entry of Ladies made this an excellent addition to the programme, with Amie Goodlad notching up the first moto win from Kathryn Booth and Nieve Holmes. The roles were reversed in the second race with Booth taking the win and the overall, with Goodlad second and Gabrielle Hamlet third, although it would be Holmes who would take the final podium position.